The battle for Aleppo: The situation in Syria cannot be solved. 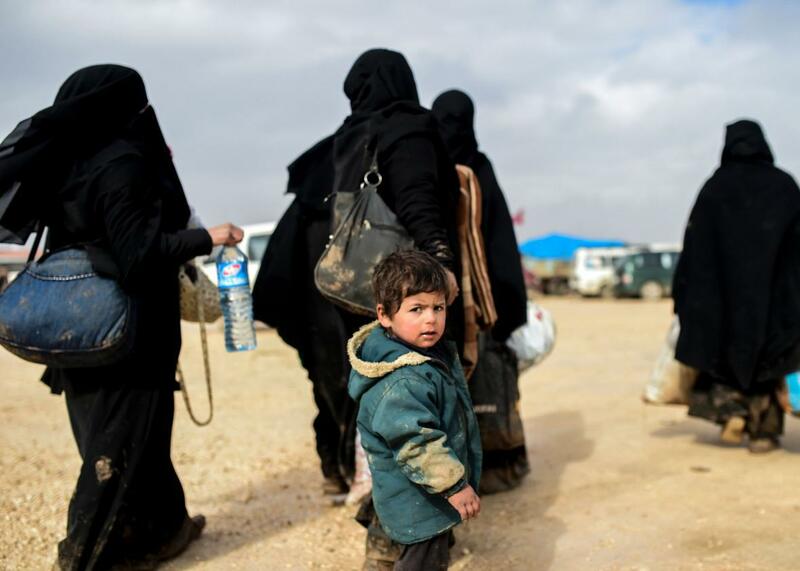 A boy arrives with women as Syrians fleeing the northern embattled city of Aleppo wait on Feb. 6 in Bab al-Salama in northern Syria, near the Turkish border crossing. The Geneva peace talks may have been the Obama administration’s last fleeting, unlikely chance to positively impact events on the ground in Syria, and they’ve now all but collapsed. Technically, U.N. envoy Staffan de Mistura says talks between the Syrian government and the opposition will resume on Feb. 25, but the opposition is rapidly losing ground around the key city of Aleppo in the face of sustained assault by Bashar al-Assad’s forces, backed by Hezbollah, Iranian militias, and punishing Russian airstrikes. The rebel forces fighting a multifront battle in the city were losing numbers and morale even before the most recent government offensive on their main urban stronghold, which threatens to cut them and as many as 300,000 civilians off completely from aid and supplies coming in from Turkey. If the talks drag on for much longer, there might not be much of an opposition left to participate in them. Given that, Assad and Vladimir Putin have little incentive to call off the assault. As Ishaan Tharoor of the Washington Post writes, Assad has long argued that the war in Syria is one between his forces and “terrorists.” That wasn’t true at one point, but as he, with Russian help, continues to crush the non-Jihadist opposition, he’s rapidly making it so. Aleppo is starting to look like the last stand of the revolution against Assad that broke out in 2011. The rebels, with good reason, feel betrayed, as the U.S. commitment to supporting them fades. (Russia, on Thursday, accused the U.S. of carrying out its own airstrikes near Aleppo, which the U.S. military denies.) The administration, also with good reason, has been wary about providing enough support to topple Assad’s government, fearing that it would create a chaotic power vacuum that would only benefit extremist groups, not unlike what’s happened in Libya since the fall of Muammar Qaddafi. The administration had been hoping against hope that a political settlement could end the violence between Assad and the opposition, help stem the epochal refugee crisis that’s straining the resources of Syria’s neighbors and threatening Europe’s political future, and get everyone on the same page for the fight against ISIS and al-Qaida. It’s not going to happen that way. So what’s next? It’s a cliché at this point to say that there are no good options in Syria, but even the bad options keep getting fewer and worse. Providing arms to the rebels on a major scale at this point would likely come too late to tip the balance of power, and the same factors that have made the U.S. reluctant to topple Assad since the beginning of the conflict are only more acute now. Some argue that to prevent a “new Srebrenica,” referring to the 1995 massacre in Bosnia, the time has come to enforce a no fly zone from Aleppo north to the Turkish border to protect civilians. This is not as simple as it sounds, even if the U.S. could force Russia to recognize it. Ground troops would likely be required to protect the zone from militia or government ground forces, there’s risk of the zone being occupied by ISIS or the al-Qaida-linked Jabhat al-Nusra. The U.S. can simply continue supporting the Kurdish dominated rebel forces who have had success retaking territory from ISIS in eastern Syria, but that’s already provoking a diplomatic crisis with Turkey—whose support is vital on a number of fronts—and there are probably limits to how far Kurdish fighters can effectively hold territory in Sunni Arab areas. Things have gotten to the point now that we’re likely to soon see prominent Western officials making the argument that it would be strategically wise and even more humane to let the Syrian government win rather than prolong the agonizing war with piecemeal support to the rebels. There’s some brutal realist logic to this, but allowing Assad’s forces, who’ve shown little reluctance to directly target civilians, to crush the remaining rebel strongholds, would be a humanitarian catastrophe even by Syria’s grim standards, create thousands more refugees, and likely drive more opposition fighters into the hands of ISIS and al-Nusra. Of course, the other option, which maximalist hawks in the U.S. prefer, is to deploy a large number of U.S. ground troops. But the American public has no appetite for another such operation in the Middle East, and there’s little evidence from recent examples that the insertion of American boots on the ground into complex multisided sectarian conflicts does much good. The idea, floated by the Saudi government this week, of sending Saudi ground troops to Syria sounds promising only if you think the humanitarian catastrophe and utter chaos in Yemen, which Saudi Arabia has been bombing for the past year, is a good model. The U.S. certainly could have handled things differently years and even months ago, but at this point, there is just no obvious course of action for U.S. policy toward Syria, and none of the options seem likely to prevent more years of fighting, more suffering, and more mass displacement. At the very least, it’s time to give up on the idea that getting everyone to the table in Geneva is the answer.